It is of vital importance to contact a professional, insured and trained roofing company, like Absolute Building Solutions, at the first sign of roof trouble. Whether your Traverse City home is missing shingles, has water spots, or flashing failure, we can help. The sooner the problem is diagnosed, the better off you'll be. We can quickly schedule an inspection for your Grand Traverse roof, and we will help you keep your roof in good repair. Extreme weather can take its toll on the exterior of homes and businesses, especially the roof. Grand Traverse and the surrounding area is known for it's cold winters and heavy snowfall. Don't let your home's roof fall into disrepair. Heavy snowfall and ice build up can cause strain on your roof. Once water penetrates the roof decking, soffits & eaves and flashing, it's time to remove the old roofing, inspect the damage and replace with new. 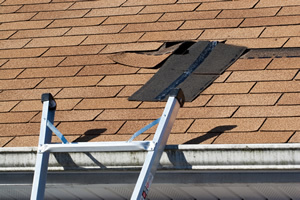 Typical signs of roof damage are blistering, brittleness, breaking, cracking, curling of shingles granular loss and leaks. Starting with new layers as opposed to adding more assures the amount of radiant heat can be handled by your attic ventilation. Increasing layers, thus increasing this heat, would challenge the efficiency of the often under-vented attic in the first place, making it harder (and more expensive) overall to cool your home. You can count on Absolute Building Solutions for your roofing repair. Fill out our online form for a free roof inspection or call us at 231-263-8300. We're happy to help diagnose problems and offer our professional suggestions to solve them. © Copyright Absolute Building Solutions. All Rights Reserved.